Extremely large, dangerous algae blooms which kill fish, pets and is very nasty for humans have been reported across North America this week form Canada to Southern California, below, is just a few which have hit the news this week. Although algae blooms apppear every year in US waters, scientists claim they are on the increase. Sonoma County public health officials are urging caution while swimming in or being near the Russian River, California after tests this week revealed the presence of a harmful toxin produced by blue-green algae near four public beaches. Blue-green algae has made its annual summer appearance in Pigeon Lake Canada. Alberta Health Services is advising people to take precautions after a cyanobacterial bloom was found in some areas of the popular central Alberta lake. 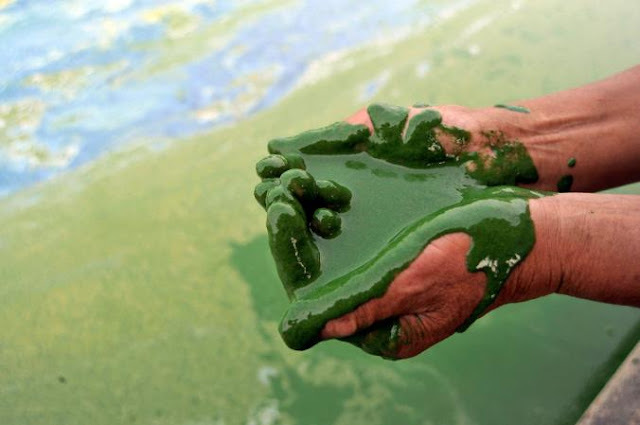 People who come in contact with the algae blooms - or ingest water contaminated by the algae - may experience skin irritation, a rash, a sore throat, red eyes, swollen lips, fever, nausea, vomiting and diarrhea. The Central Valley Regional Water Quality Control Board and the California State Parks are urging swimmers, boaters and recreational users to avoid direct contact with, or use of, waters containing blue-green algae (cyanobacteria) now blooming in San Luis Reservoir and O'Neill Forebay located in Merced County on the western edge of the San Joaquin Valley. Due to the potential health risks, the San Luis Reservoir and O'Neill Forebay are now posted with health advisories. Water samples collected by the Department of Water Resources on July 11 and July 25 exceeded the trigger levels for the protection of human health from the California Cyanobacteria and Harmful Algal Bloom Network's Voluntary Guidance. State Fish and Wildlife … Nebraska fish biologists investigating cause of fish die-off, thought to have been caused by a harmful algae bloom. Southwest District Health has issued a public health advisory for Lake Lowell, California, after toxic algae has turned up in the water. Florida’s Treasure Coast has seen the worst of the blooms this summer. The first signs of the bacteria began in the late spring, and by the Fourth of July weekend it seemed to explode, sending tourists and locals out of the water. The Chittenden Reservoir, Vermont, is on high-alert after large amounts of blue-green algae were observed by monitors during a recent visit. According to the post on the state's blue-green algae tracker "dense scums or highly colored waters were present." Health officials are warning people to stay out of Big East Lake near Payson after the discovery of a potentially toxic algae bloom. The Utah County Health Department said Wednesday that water samples contained levels significantly above the level that's dangerous for human health. The Capital Regional District is issuing an advisory about blue-green algae at Elk/Beaver Lake Regional Park Canada. Visitors are advised to avoid Beaver Lake, and to keep animals on a leash to stop them them from drinking or swimming in the lake. Ingesting the water may cause a range of symptoms, from headaches and abdominal pain in humans, to lethal liver damage in dogs.